President Barack Obama witnessed the extent of the damage during a visit to the devastated New Jersey coastline Wednesday. NBC's Lester Holt reports. Updated at 1:29 a.m. ET: Residents of the Northeast eager to get out and about after Superstorm Sandy's rampage discovered Wednesday that they couldn't get very far. Contributing to this report were Robert Bazell, Jay Blackman, Bill Briggs, Tom Costello, Jonathan Dienst, Maggie Fox, Lester Holt, Miguel Llanos, Jim Miklaszewski, A. Pawlowski, Jesse Rodriguez, Al Roker, Sarah Rosefeldt, Anne Thompson, Katy Tur, Ali Weinberg, Jason White and Brian Williams of NBC News; and NBC 4 of New York, NBC 10 of Philadelphia, NBC Connecticut of Hartford and NBC station WMGM of Atlantic City, N.J. Follow M. Alex Johnson on Twitter and Facebook. Three of seven flooded East River tunnels in New York City were cleared of water Wednesday. Full bus service was restored before being suspended overnight in southern parts of Manhattan. Some train service resumed. Very limited subway service was set to resume Thursday — none of it, however, south of 34th Street in Manhattan because of stubborn power failures. Two of the area's three major airports — Kennedy in New York and Newark Liberty in New Jersey — reopened with restricted service. New York's LaGuardia Airport was projected to reopen Thursday with limited flight schedules. The New York Marathon will go on as planned Sunday, race and city officials said. New York Mayor Michael Bloomberg said power should be restored to most of the city by then. "We will get up and get this rebuilt," New Jersey Gov. Chris Christie said as he surveyed the state's battered coastline with President Barack Obama. And Bloomberg said, "We are on our way back to normal." But residents who ventured out might not have noticed it. New York City's beating heart, its 108-year-old subway system, remained largely crippled. Many tunnels connecting the city with its outer boroughs and New Jersey remained closed or restricted. The region's airports offered only minimal service. Packed buses sped past lines stretching around entire city blocks. Many intersections were closed because of accidents caused by inoperative traffic signals. To ease the gridlock, Bloomberg ordered that only cars carrying three or more people would be allowed into the city across four East Side bridges Thursday. Gov. Andrew Cuomo, meanwhile, authorized transit officials to waive fares on all commuter railways, subways and buses through Friday night. Connecticut Gov. Dannel P Malloy announced that commuter rail service between Stamford and New York's Grand Central Terminal will resume Thursday morning, and that rail fares for Metro-North service would be waived Thursday and Friday. Resident Anthony Sessions set out from Manhattan for Brooklyn to see for himself what Sandy had left behind. "It took five buses to get to downtown Brooklyn," Sessions told NBC News. "I walked across the Brooklyn Bridge because of the work in Stuyvesant Town. "I had no idea what had happened," he said. Many people turned to rental car agencies for transportation, only to find that they had few cars to rent. "It's people saying, 'I'm stuck; I've got to get out of here,'" Richard Broome, a spokesman for Hertz Rent-a-Car, told NBC News. "For this kind of activity, you only see it during truly catastrophic events — major natural disasters and, for example, 9/11." In any event, gas was scarce at the few stations that were open, and lines to get it were backed up as long as an hour. On one side of an Exxon station in Belleville, N.J., cars stretched down the street, snarling traffic. On the other, people stood in line with gas cans in hand, grabbing as much fuel as they could for cars and generators. A man from Montclair said his girlfriend's car ran out of fuel in line at another Exxon station. He offered money to people for their empty gas cans, hoping to carry away as much fuel as possible, but he didn't have any takers. The station's owner told NBC News that the pumps would run out of fuel about 8 p.m. ET. He said Exxon had a new shipment of gas on the way but that it wouldn't be in time to help anyone Wednesday night. Price gouging was becoming a concern, especially in New Jersey, where about 100 people had called the attorney general's office to complain. "Some gas stations have raised their prices by 20 to 30 percent in one day," Neal Buccino, a spokesman for the state's Division of Consumer Affairs, told NBC News. "Some hardware stores have doubled the price they charge for generators overnight." News agency tallies indicated that Sandy killed at least 63 people in the U.S. after it came ashore Monday night. More than half — 34 — were in New York City, officials told NBC News. Breezy Point, N.Y., a Queens neighborhood that lost more than 100 homes, endured catastrophic damage. NBC's Brian Williams reports. Many of those were drownings on Staten Island, where rescuers going house to house were finding people floating inside their homes, NBC New York reported. About 6 million homes and businesses — two-thirds in New Jersey and New York — were still without power. Ninety percent of Long Island was without power, and it could take as long as 10 days to restore all service, Rep. Steve Israel, D-N.Y., told MSNBC TV. Health and Human Services Secretary Kathleen Sebelius declared a public health emergency for New York, helping to make sure Medicare, Medicaid and children's health beneficiaries continue to receive services. About 500 patients at New York City's Bellevue Hospital were evacuated to other hospitals after floodwaters crippled its equipment and power supply. New York City schools will be closed the rest of the week, Mayor Michael Bloomberg said. Sewage was backing up into homes near a flooded sewage plant in Nassau County on Long Island. Authorities feared that it could spread to thousands of homes. The U.N. Security Council had to move because of water damage to parts of U.N. headquarters in Manhattan. More than 3 feet of snow had fallen in parts of West Virginia, where 220,000 homes and businesses were without power Wednesday afternoon. Red House, Md., got 30 inches of snow. In Chicago, forecasters warned that high waves and flooding were possible on the Lake Michigan shore Wednesday. Sandy caused waves up to two stories high on the Great Lakes, forcing cargo ships — some longer than three football fields — to seek shelter. In New Haven, Conn., Sandy blew down a tree that uprooted human remains and what appeared to be a time capsule. More than 70 percent of homes remained without power in Greenwich, Conn., where downed trees littered the landscape. In Westport, 85 percent of customers still had no power. Much of New Jersey, where the storm made landfall, remained in dire straits. Aerial footage Wednesday showed fires raging among storm-damaged homes and sand pushed inland. Christie ordered that Halloween trick-or-treating be moved to Monday because of the unsafe conditions. Many communities in Connecticut also delayed trick-or-treating. Hoboken, just across from Manhattan, became a virtual island. At least 20,000 people — about 40 percent of the population — remained stranded Wednesday as 500 million gallons of water overwhelmed the town. Authorities said it would take at least two days to pump all the water out. The National Guard showed up Wednesday to deliver equipment, food and supplies, but much more is needed, Hoboken Mayor Dawn Zimmer said. "We need more food," Zimmer told NBC News. "We need more resources, so anyone who's listening to this in the city of Hoboken or neighboring towns who can who can get to us, we ask you to come and deliver your supplies." Particularly critical: "We truly need, we need more fuel," she said. The National Guard arrived Wednesday in Hoboken, N.J., rescuing the elderly trapped inside their homes and delivering food and supplies. NBC's Katy Tur reports. In Brigantine, Obama, Christie and Anthony Fugate, administrator of the Federal Emergency Management Agency, comforted residents and vowed that every possible resource would be made available. "We are here for you, and we will not forget," Obama said. "We will follow up to make sure you get all the help you need to rebuild." Obama praised Christie for putting "his heart and soul into making sure the people of New Jersey bounce back stronger than before." Christie, in turn, said he and Obama had "a great working relationship." He thanked Obama "for his concern and his compassion for the people of our state," saying it was important to have the president "acknowledge all the suffering that's going on here in New Jersey." New Jersey Gov. Chris Christie comments on his meeting Wednesday with President Barack Obama as they toured areas of the coastline hit hard by Sandy. That suffering is likely to stretch for months in New Jersey, where at least 2 million customers remained without electricity. 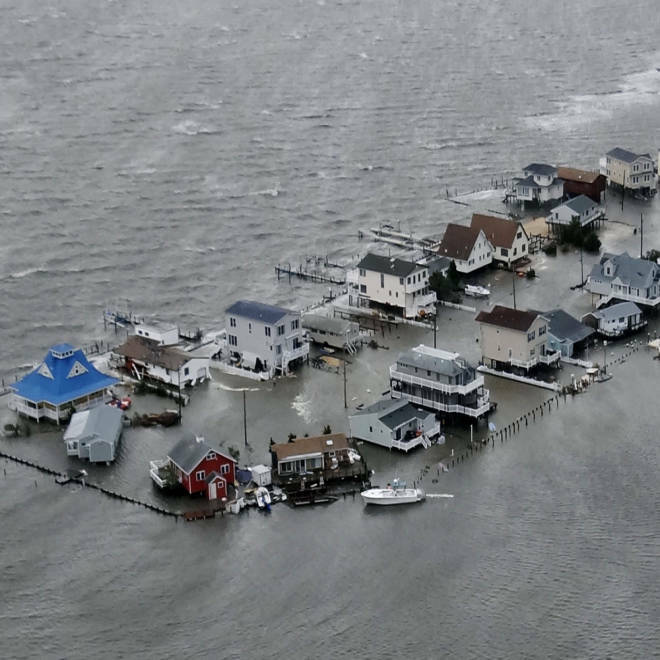 "All the houses on the oceanfront on the north end of my town — all their bottoms have been washed away," said Thomas Boyd, the police chief in Seaside Heights. "Their foundations are gone." In Point Pleasant Beach, one of the hardest-hit areas, Lisa and Rich Morico carried away what they could as they left their home for what was likely to be a very long time — "I have no idea" how long, Rich Morico said. Looking over the remains of their home, he admitted: "I don't want to say in front of my wife."